Emerging from the flames and wreckage of a plane crash, you find yourself immersed in a beautifully rendered world that tests your ingenuity and wit, as you're forced to face off against an indigenous population of genetically mutated cannibals. Sure, the premise is simple, but what sets The Forest apart from the competition are the design choices that EndNight Games are making to create a world that blurs the line between what it means to be the hunted, and the terrifying reality of realizing that you must become the hunter. Stepping into the dense forest immediately presents players with the challenge of adapting to the world around them. This means harvesting the forest's resources to construct makeshift shelters, hunt wildlife, gather plants and even find natural water sources to stave off your growing thirst. Ensuring that you are at peak condition is crucial because the environment will test your limits. See, The Forest is setting itself apart by focusing on pure immersion into a world that manipulates your fears in the dark of the night.We recently sat down for an exclusive interview with EndNight Games and they explained to us just what to expect from their highly-anticipated title. EndNight wrote: "The team mostly come from a visual effects background and so for all of us we're really excited about cool new technology and lighting and shading techniques. We want to make the visuals as good as we can get them to be. Realism and immersion are very important for us. We want the player to feel as if they were dropped into a world." It's one thing to have a believable environment, but ensuring that players have a dense world with a rich mythology is entirely different. EndNight has been continually altering the size of the explorable world in order to include plenty of hidden secrets to reward your spirit for adventure. Additionally, players will be able to gather enough resources to construct rafts. This means that the surrounding islands are a viable option for discovery. EndNight's focus on creating a dense world, ripe for exploration, rather than merely focusing on the size is what drives the game's sense of immersion. There's no denying that struggling for survival in a randomly generated world can be engaging, but this isn't Minecraft. 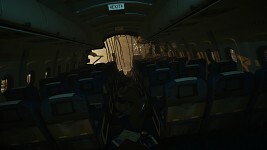 In spite of the team's experimentation early on with the ability to generate new worlds whenever players wanted, they opted instead to focus on their approach to horror through grounding players in the world. EndNight wrote: "The real difficulty is in making an interesting world without much repetition and so for our main game mode we've decided to go with an authored layout. We may at some point add back in the option to re-roll a new world." Yet, it puts my mind at ease knowing that The Forest is concerned with delivering a truly immersive survival experience that focuses on your interactions with the world around you. EndNight has gone to great lengths to ensure that a level of verisimilitude grounds players in the world. For instance, many of the plants you find in the world are modelled after real world equivalents in order to ground the game in reality. Players even run the risk of over harvesting the world around them. EndNight wrote: "Having an environment where you can chop down any bush or tree, makes those elements a game play in itself. Clearing areas of the environment will affect your building as well as your interactions with the enemy threat." These interactions with the world are the core of what drives The Forest's survival gameplay. EndNight is taking extreme measures to ensure that your palms get sweaty during each encounter and that dealing with the threat is a matter of understanding that these enemies possess their own unique sets of behaviors and patterns that drive your interactions with them from your very first encounter. This dynamic engagement with your enemies presents an interesting moral dilemma for players. Witnessing the care that the cannibals possess for one another may ultimately force you to question your methods and leave you wondering who the real enemy is. 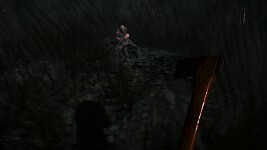 Witnessing the cannibals react to their fallen comrades will certainly force players to consider the cost of their survival and even directly impact the way they play. Are you going to actively hunt the cannibal threat down and slaughter them like cattle, or, will you simply play defense? EndNight has made it clear that at some point in the game they hope that players decide to make that switch from being the hunted into the hunter, but it’s a choice you’ll have to face as you find yourself confronted with life or death. Whether you choose to explore the complex system of realistically modeled caves and eliminate every enemy (yes, there are a limited number of cannibals), or simply secure your perimeter with traps, EndNight is ensuring that the decision is yours to make. 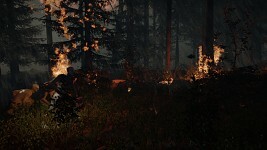 Just make sure that you can survive the night when The Forest launches later this year.